You work in the noblest profession around. working as hard as you do? leaving you to live on less than 50% of your final salary. That's why there’s the 403(b) plan. It helps you own your financial future. A third of your coworkers have one. And it could be the difference between securing a comfortable life after school and just making ends meet. * After taxes, assuming the interest is taxed at 25% and an annual savings account interest rate of 1%. ** Assuming an average annual return of 3%. Even if retirement is many years away, now is the most powerful time to save for it. One of the greatest savings tools around is the 403(b) plan. A 403(b) is a long-term savings plan for public school employees. It allows you to contribute a portion of your salary to an employer-sponsored plan that can supplement the benefits you are entitled to through the Florida Retirement System. Contributions to your 403(b) plan through automatic payroll reductions are tax-deductible, which means you can place money into the 403(b) plan without having to pay any taxes on it now. When you contribute to your 403(b) plan, your investment can earn income through tax-deferred appreciation, meaning you do not have to pay taxes on dividends, interest and capital gains when they are earned. Once you retire, you pay taxes on benefit payouts, at which point you may be in a lower tax bracket. You can secure your financial future and fill in the gap left by the Florida Retirement System and Social Security. I am ready to start saving! 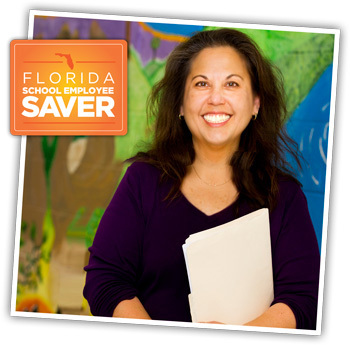 To get started, contact your local school district’s human resources and employee benefits department.